Description - Shaw Sound Advice carpet tiles appear to be a solid colored tile from the distance, but are actually a multi-colored tile that utilizes various color fibers to create each tiles overall color pallet. This floor tile collection comes in 16 colors and can be used as flooring for an entire room or as a custom area rug. 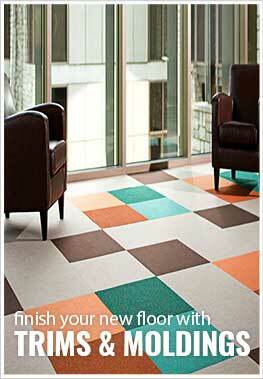 These carpet tile squares are very easy to install only needing double-sided tape for most installations. Installation of carpet tile is easier than installation of broadloom carpet and carpet tiles are just as easy to clean and maintain as broadloom carpeting. These modular floor tiles are also very environmentally friendly using recycled materials for both the backing and fibers, making them the perfect product for anyone looking to go ‘Green’. Sound Advice tiles are backed by a lifetime warranty, and are sure to last for as long as you own your flooring. Recommended Uses - Shaw Sound Advice carpet tiles have been used in both commercial and residential applications because of their durability, versatility and ease of installation. Because of these facts, carpet tiles are quickly replacing broadloom carpet and have been installed in nurseries, basements, kitchens, bedrooms, weight rooms, home gyms, garages, workout rooms, and elderly care rooms and many other areas. Available in 16 popular colors. Ordering was completely hassle free. Tiles arrived right on schedule and damage-free. I install them in my basement on painted concrete (I thinned primer paint and put a light coating on the concrete to control dust.) The only tools I used were a utility knife with several blades so I could keep a sharp one in use at all times (very important) and a straight edge. Trimming the tiles to size when necessary and nstallation were a breeze. I installed a vinyl tile "path" through the carpeted area, so I had to glue down a few of the smaller pieces adjacent to the vinyl. Other than that, they fit and lay perfectly without any adhesive. I highly recommend. Shaw Sound Advice is a quality product. Color representation is very good on the monitor, but DO take advantage of the excellent sample service. Double sided tape has worked fine on a clean, sealed foundation. Take the thickness pictures with FDR dime seriously. Carpet is dense and the tiles are solid, but the pile is tight and short. Pay attention to the arrows if monolithic is your goal (it was ours). For new residential customers, you need to know that you will have to inspect and sign for the order. Our carrier rolled 13 boxes into the driveway, but that was as far as he could go. The carrier called on Friday to confirm Monday delivery. No time, but the driver did call when he was on his way (at noon). If we still worked, it would have been a headache. It took about 8 days to receive from GA to TX. Customer service, including packing and delivery, has been very good. We have not had a problem to need to call about. I had a wonderful experience with this company. I needed multiple samples, because there were SO many people offering opinions (I ended up doing what I originally planned). My samples arrived quickly, except for one that had to come from an outside company, and Rubber Flooring said they might not agree to send them. My actual tiles arrived quickly, too, and are installed. I would say use this company!